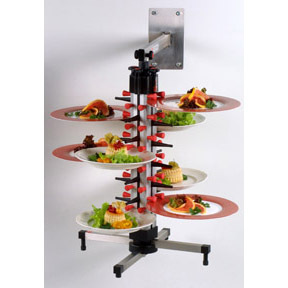 This wall mounted 24 plate tree is especially useful “mate” in kitchens on board ships, RV’s, barside, or the private home. This wall mounted 24 plate rack would be a useful addition for any space in the kitchen where you often need a third hand to hold your plates. 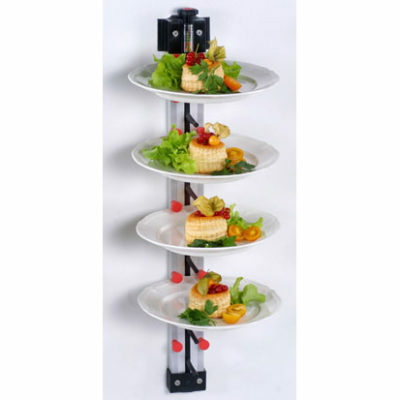 This 24 plate stacker is a true helper in your kitchen when entertaining or in the industrial kitchen, bar, or pizzeria. 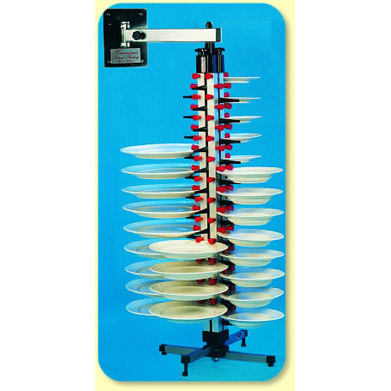 This 24-plate wall model is equipped with a suspension eye at the top. It can be suspended from a wall-mounted support arm or mounted directly on the wall as a permanent fixture. This could be especially helpful in cold storage areas. This unit can be converted to a table model easily by using the table model base. 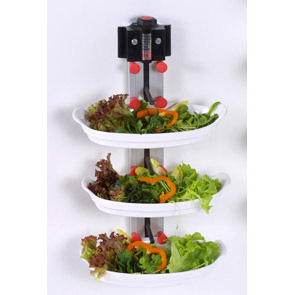 Use it on a table when loading or serving then suspend it out of the way. Pre-plate salads for your happy hour dinner rush complete with dressing. Or free up wait staff by putting your happy hour favorites on one of these at the end of your bar or behind your bar.